1. Who are the "1,580 people screened for lifestyle related diseases in six hours" and how were they chosen? It is important to understand whether the sample is representative of "Bhutanese", as the article title claims. Are these people who visited the hospital in Thimphu? Are these Thimphu residents only? The chart only shows the results only for the 600 "unhealthy" people. The article mentions that 980 (62% of the sample) did not exhibit any of these symptoms. The numbers on the pie slices are supposed to represent a percentage, not the number of people. A % sign would have made it clear. But wait: the percentages in the pie chart add up to 100%. This means that each person in that pie has only one of the four symptoms Of course, that is not true. 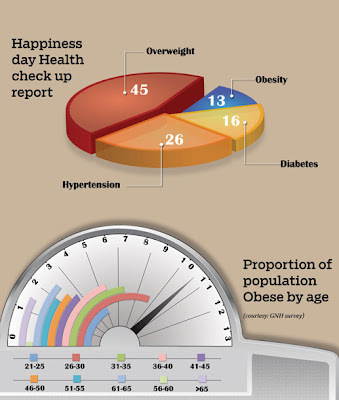 Overweight and hypertension is a popular combination, and so is obesity and diabetes. So the picture does not tell us the correct story. 3. Reporting of numbers requires telling a story that is meaningful. When we hear statistics, we try to make sense of them by comparing them to some benchmarks or to each other. So, sentences must be coherent and meaningful. For example, what does the following sentence tell you, and how does this information match the pie chart? "Of the 600 unhealthy, 51 percent were men and 61 of them were diabetic." 4. A chart based on the (2008 or 2010?) GNH survey is attached right below the Happiness Day checkup pie chart. But I only understood that the two charts are from different data sources (and periods) after spotting the tiny text "(courtesy: GNH survey)" and reading the article carefully. The age groups are ordered from young to old in the legend, but from old to young on the chart. Confusing! So those longer pink, green, and red noodles do not correspond to older folks, but rather to the younger ones. In this type of (highly unrecommended) chart it is already difficult to match age groups with obesity rates, so why make it even more confusing by reversing the order? What do the numbers on the dial represent? the title reads "proportion", but these are more likely percentages. It is difficult for our brains to compare the lengths of bending noodles. Try this: Which age group has a higher obesity rate, 46-50 or 61-65? Are the 56-60 year olds extremely healthy compared to everyone else (with nearly 0 obesity rate) or maybe their data is unfit? In short: A simple bar chart with straight bars, one for each age-group, ordered from young to old, would have been a better choice. And larger annotation telling us that this is based on a different dataset from a different source and period. Lastly, in order to show a trend ("becoming unfit"), I'd like to see numbers and charts showing the increase over the years. Since there is no concrete data, nor anyone from health has taken important research task related to this, now a few layman has started to make inference esp. report such as this with conflicting and distorted figures. It only makes outsiders to point the flaw, when insiders are happy about it. Complacent bhutanese work.